Living just off Archway Road, and with a bus-obsessed three-year-old, I see a lot of the 43, 134 and 263. But there’s another bus that runs close to me – the W5. How close? Hard to say. It’s passed me, but I’ve rarely managed to catch it. The W5 is one of numerous London bus routes with a Hail and Ride section. What this means is that a long portion of its route (on this map the bit between Hornsey Lane and Crouch End Broadway) has no bus stops. Instead, passengers stick out an arm to hail the bus. There are two problems with this: stopping and planning. Hail and ride might work well if you live very close to the route, take it regularly and know where the drivers may agree to stop. But for anyone else, it renders the Hail and Ride section unusable. W5 drivers – and those on the other north London Hail and Ride routes I’ve tried – are notoriously fickle. Nothing prevents a lorry parking in the spot where they might usually agree to pull in. Sometimes drivers simply don’t stop. Like others, on a couple of occasions I’ve hailed the W5 at a spot where I’ve seen it set down passengers, only for the bus to sail past with the driver pointing a thumb behind him. Cheers. Perhaps most importantly, Hail and Ride sections aren’t incorporated into the TfL online transport planning data. How could they be, when no bus stops exist along them? Use the TfL travel planner and you’ll be sent a long way round. 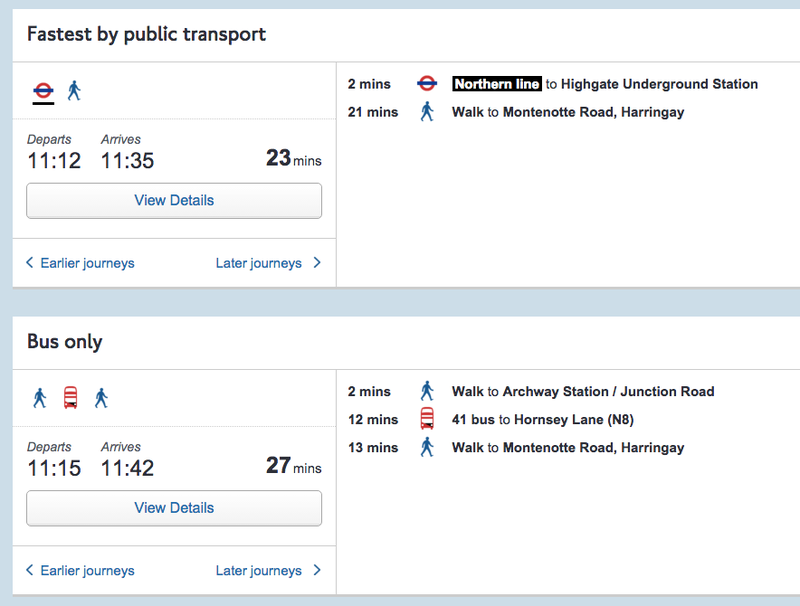 A child wanting to go from Archway Tube to Highgate Wood School would be sent on a 27 minutes bus and walk route, not the ten minutes door-to-door service of the W5. So the opportunity to boost passenger numbers on these suburban routes is lost, and the would-be user is deterred by their inability to plan the quickest journey via TfL or Citymapper. TfL did include Hail and Ride sections on the 2015 updates of their London bus maps – Diamond Geezer has more details – but only a true bus enthusiast pores over those. Of course, installing a bus stop carries costs to the local authority and TfL. But alternatives exist. 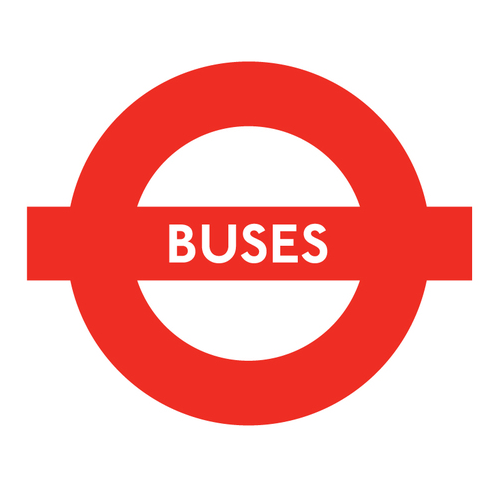 One low cost option would be to paint a TfL Buses logo (see below) and the route number on the pavement. Another would be to make the bus stop physically invisible, but create it as a virtual entity on online travel planners. Passengers would know where to wait, but the street would be unmarked. In the meantime – sorry, Crouch End. But when Hail and Ride is sorted it’ll be easier for me to visit the new Picturehouse and for N8-ers to visit Waterlow Park. Make the stopping procedures clear and the problems will be eliminated. At the moment no one is sure where and if the bus will stop. i regularly use this handy little bus and have had no trouble hailing it. Timetables are given on the tfl site. Obviously it can’t stop where it”s dangerous to do so. I’m lucky enough to be served by a W5 bustop in Hornsey Lane but when I had to try and catch it in shepherd’s hill once, there was no way of knowing where to hail it. I just looked for a likely group of people and asked if they were waiting for it. They were and they all agreed that ‘hail and ride’ doesn’t really work. I did sign up some new members for HNF that way though! It’s easy. Get on at Archway and ask the driver!